these five differences make up the universe." 1 . Harih para tarah - Hari is the Supreme Being. 2 . Satyam Jagat - The world is Real, not Mithya or illusion. 3 . Tatvato Bhedah - Difference is Real. 4 . Jeeva Gana Hare ranu charah - All the Jivas are Hari's Servants. 5 . Neecho cha bhavam gatah - with gradation among them. 6. Muktirnaija sukhanubhutih - Mukti is the enjoyment of (the soul's) innate bliss. 7. Amala Bhaktischa tat Sadhanam - pure bhakti is the means of attaining mukti. 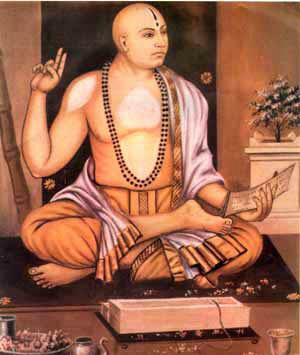 c. By Shastras 'Agama". Tru Knowledge of the world can be gained by the above three means. It is "Tritayam". 9. Akhilamnaiyaika Vedyo Harih -Lord Sri Hari can be known by Amna (or, Veda) only.